My brother Ed (who is a farmer) was over helping me work on a 2001 MDX and one of the rear studs broke off. For some strange reason the engineer that designed the hub has the flange tapered in such a way that there is no way to pound the old stud directly out or slide a new one in without hitting the flange. I looked on the Internet and the instructions for replacing the stud varied from removing the entire hub assembly and pressing the bearing out to using a slide hammer to remove the hub, which in almost all cases damages the wheel bearing, requiring it to be pressed out and replaced. I went out to my garage with 6 pages of printouts of the process. My brother Ed took one look at it and said “that is crazy”, and told me that while I was surfing the web he had figure out a way to replace the stud without removing the hub at all. The process worked and around 30 minutes after I’d picked up a new stud the wheel was happily back in place. 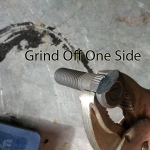 You’ll need to be reasonably proficient with a grinder if you are doing this yourself. I expect the same process would work with a broken stud on a Honda Odyssey or Honda Pilot as well. Remove the brake assembly (2 bolts) and the rotor (2 screws) and one side of the emergency brake. 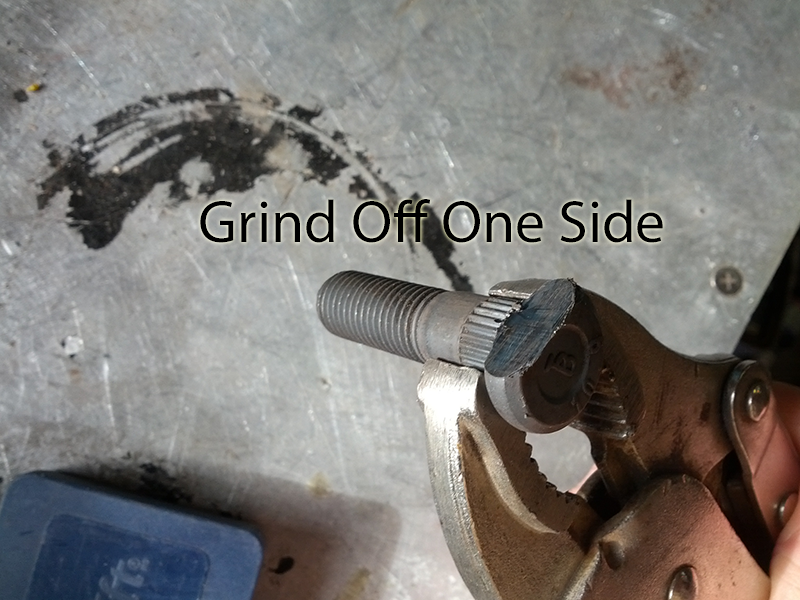 To remove the old stud use a hand grinder to grind it off almost flush with the hub. Be very careful to not grind the hub at all. Its probably safest to cut it around 1/4 high and then carefully grind the stud down. The short piece of stud left will now pound out ahead of the tapered part of the flange. The new stud needs to have one side of the back ground down so it is flush with the shaft. This will allow it be inserted in spite of the taper. 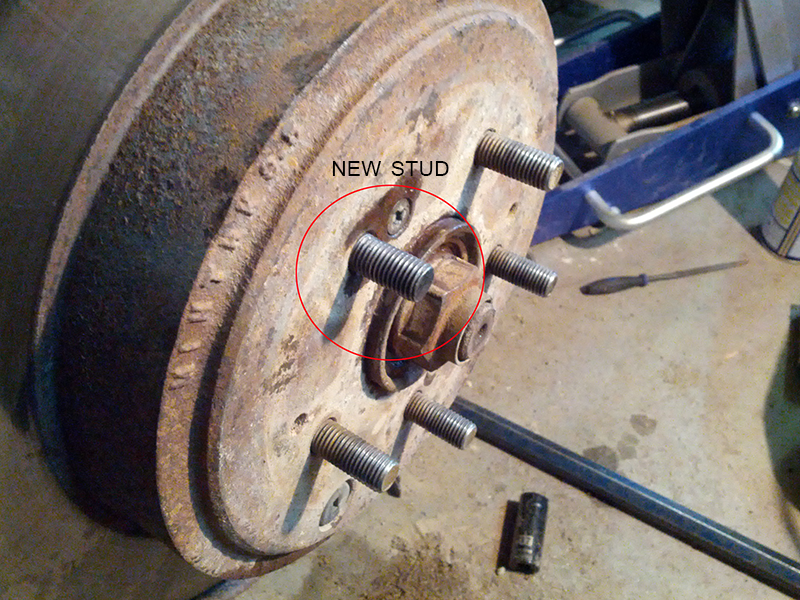 The stud will need to be shortened slightly to fit into the space behind the hub. We ground it down on a bench grinder checking frequently to make sure we removed only the required amount. Bevel the tip slightly with a hand file after grinding. 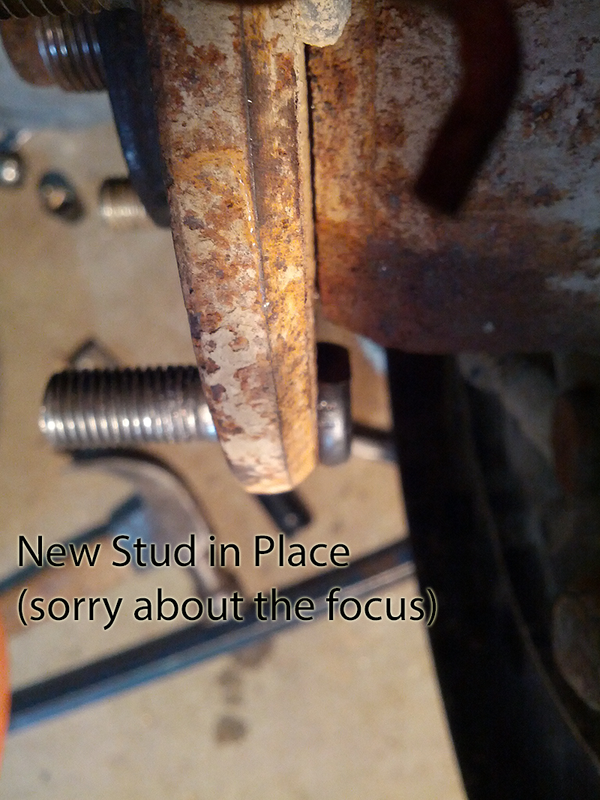 Insert the modified stud into the hub and use washers and a spare lug nut to force it back into the hole. Since you are pounding quite hard on the lug nut you may want to replace it with a new one if there is any thread damage. We used a spare one and threw it away afterwards. Once the stud is in place reassembly your brake, rotor, and brake assembly. Reinstall the wheel. The new stud is a bit shorter than the rest, so you wouldn’t want to replace multiple studs this way, but it still had 7 full turns thread on it. To state the obvious; this process does not follow Acura standards and would be used at your own risk. 2002 Acura MDX – Front stud removal and replace. Is very similar to the rear axle. I did need to use a tap and Die to re-thread the new stud in a certain area. There is also an area where the front splash guard needed to be cut away. A simple and easy grind. All in all the expense and risk of a new Hub replacement out weighed the cheating that went on. From a safety standpoint I now have 5 studs holding the wheel on. A larger bolt pattern would have made the job proper.Thumbs down to Acura.